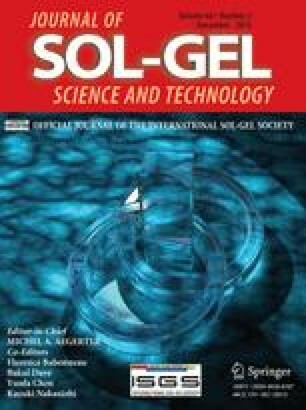 Two model drugs of different physico-chemical and pharmaceutical properties (ibuprofen, acetaminophen) have been incorporated together or separately in silica-based microspheres using sol–gel and spray-drying processes. A variable amount of a neutral surfactant Brij-56© has also been added. The properties of the microspheres vary significantly depending on their composition. Three kinds of texture are identified: (1) silica containing spheroid nano-domains (formed by ibuprofen; diameters between 20 and 100 nm), (2) silica containing worm-like mesophases (formed by Brij-56© and both model drugs, typical correlation distances ~6 nm), (3) silica intimately mixed with the drug (acetaminophen) without visible phase-separation. The kinetics of drug release in simulated intestinal fluid strongly depend on these textures. The association of ibuprofen and acetaminophen in a single type of microsphere and without surfactant favours a concomitant release. Possible mechanisms of materials’ formation are discussed. CNRS and Institut Carnot are acknowledged for funding.